NEWS FLASH: Your company’s IT practices are archaic, and young, talented employees want nothing to do with you! 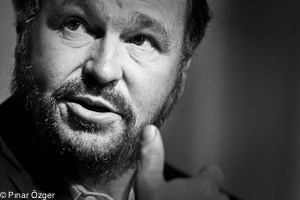 While VMware (s vmw) CEO Paul Maritz didn’t come out and say exactly that, his keynote Tuesday morning at EMC World (s emc) did certainly did try to drive home that point. The “Facebook generation,” as Martiz called it, is post-PC and post-paper, and they want to experience information within the context in which they’re consuming it. And like it or not, they’re the future. They need applications that appeal to them and tools to help them develop applications how they want to. As he has explained before, the infrastructure software that pads VMware’s bottom line is critical to this vision, but it’s just an enabling technology for new applications. It needs to become “invisible.” That means automation like many enterprises have never experienced it — even VMware. He also beat the drum for big data, especially as it relates to monitoring these large, cloud-like infrastructures in real time. VMware has one customer, he explained, whose cloud environment generates 500 million events an hour — a volume no human could ingest much less make sense of. Much of that might be coming from the mobile devices from which employees are accessing applications, or the potentially millions of devices otherwise feeding data into a system. If you’re going to be efficient like Google is, if you want to “be able to afford these new experiences that have to be delivered,” automation and analytics are critical. Further up the stack, Maritz said, “you have to bake the automation into the application.” He called for policy-based management versus script-based management, and policies that follow applications as they move across resources. That means routers, switches, load balancers and other gear need to adhere to logical constructs rather than physical constructs so applications aren’t tied to a single rack or even a single data center. You can expect to hear a lot more about VMware’s vision when I speak with CTO Steve Herrod at our Structure conference next month, but the vision really expands beyond VMware. At Structure, we’ll also talk about everything from cloud computing to software-defined networks to Facebook’s Open Compute Project. It’s all part of a bigger picture around automating what can be automated and making hardware a true commodity that just serves as the home for intelligent software. In the end, it’s the applications that matter and everything below needs to serve their needs as effectively and as efficiently as possible. But that’s not really going to be feasible until we have application software that is self aware, adaptive and self-regulated. Interested in seeing how VMWare solves this problem. I believe he’s talking partially about BYOD and partially about enterprise tools. Barb’s earlier post on the hidden pitfalls experienced by IBM equally apply to VMWare’s statement above.